I grew up in California and went to college in San Francisco. I spent a bit too much time having fun out there. In 2010 I then took an impromptu 5 week trip to Australia to try to “get some perspective on my life” and ended up staying for 3.5 years. When I decided I didn’t think I wanted to live the rest of my life in Australia I took a solo trip through Asia for 15 months. I ended up back in the states in 2015 and landed in Seattle, hoping to live an outdoor lifestyle. I quickly found that I was stuck in traffic for most of my days. 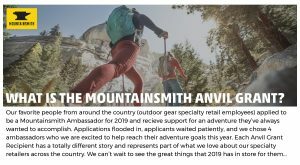 I built out an AWD Astro van, quit my job and moved out of my apartment to live on the road for a while and pursued working outdoor education with NOLS. 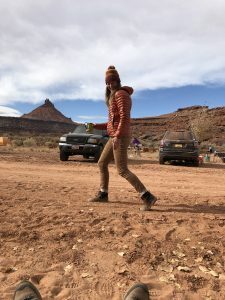 I quickly realized that #vanlife is #notforme and landed a life that seems pretty balanced living here in Salt Lake and working for Backcountry. In my free time I am usually trying to do something active. 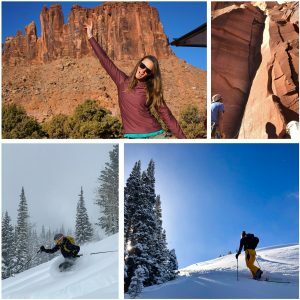 Climbing and Skiing are probably my biggest passions right now but I also try to stay in shape with trail running, yoga, and sometimes I even get out on my mountain bike. 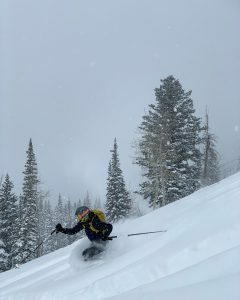 I spend a lot of time chasing my boyfriend down the mountain because I am still new to a lot of the activities I am participating in and he keeps things fun and challenging for me. When I am inside, I actually like to sleep a lot! Some other things I enjoy are reading, trying to practice guitar, drawing and watercolor when I am outside in beautiful places, and I just picked up Linocut printmaking which has been really fun. 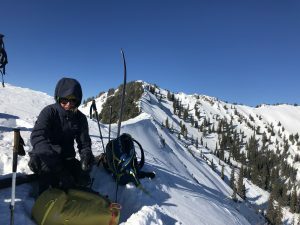 I am hoping to re-attempt climbing the direct north ridge of Mt. Stuart in Washington state. Hopefully sometime in Late September / Early October. 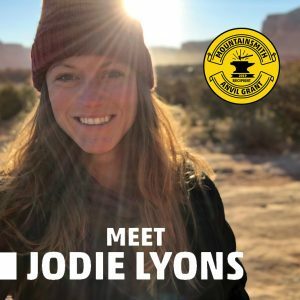 Jodie’s made great use of Utah’s backcountry terrain since she’s moved there. I am a goal setting fiend and have many goals this year. Mostly I am trying to increase my overall base fitness and endurance and using climbing / mountain biking / trail running and skiing to accomplish this! A plane ticket to the universe or earth? I suspect there may be some extremely rad climbing out in the outer stretches of our universe. If I had unlimited budget though I would love to do a worldwide multisport adventure. I love being able to combine multiple activities into a single trip so I would probably enlist the help of a partner or two to plan a cross continental multisport link up!